This entry was posted in Blogsphere, health care, Media, Politics and tagged Canadian health care, health care, right wing noise machine. Bookmark the permalink. Rethuglicans and their followers and enablers lie constantly. It may be an actual neurological condition associated with being a Republican. Perhaps they could get treated in Canada for it. The Canadian cure for the nuts is to ship them in the United States. We Canadians have our own private system to bypass the poor people waiting in line. No point going in the US unless you would like to recover from a knee surgery under the sun of Florida. 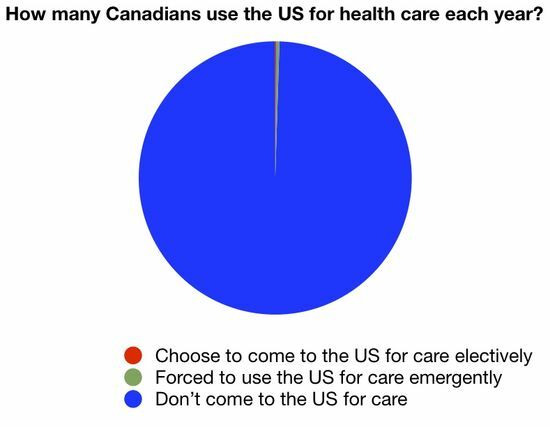 As the graph points out, most Canadians using American healthcare do it because they become suddenly sick or hurt on US soil. But for the vast, vast majority of people, that’s not happening. You shouldn’t use the anecdote to describe things at a population level. And this is different than the Leftists trotting out little children who have lost their mother because she didn’t see a doctor? Seattle 5th grader, Marcelas Owens, was right next to President Barack Obama as he signed the health care bill into law Tuesday. “It’s exciting to think that I might have played some small role in helping the health care bill pass,” said Marcelas. He’s been in the national spotlight after speaking before congress earlier this month. His mother, Tiffany Owens, died after losing her health insurance. The WHOLE of the Liberal policy success is based on the premise that if we can show ONE starving child of a minimum wage-earning single mother, we can push through minimum wage hikes. If we can show ONE example of a child suffering because their parent lost insurance, we can make the case that we need national Health Care. The fact that someone one the Right co-opts your strategy may very well upset you, but please don’t act so “OMFG” about the whole thing. The fact is the the Canuck’s Medical Care delivery system is failing. It’s running massive deficits, is rationing care, posts inhumane wait times and really doesn’t provide the quality of care that we experience in America. Thank God, America has the best healthcare in the world, no deficit problem and had won the war in Afghanistan and Irak a long time ago. If I ever live in the United States, it’s with the confidence I can go back to Canada if I get very sick and need to be treated as a decent human being. Our deficit problems are due to social welfare nanny state programs. It could make sense if Clinton’s America didn’t make surplus before Bush took over. And before Bush’s depression, Canada had big surplus as well. Maybe you should read a book, or something. Do you know who passed the bill that Clinton then signed into law? For example, it was the Republicans THIS year that stopped massive tax hikes on all Americans. Obama signed it, but it was Republicans who forced the bill through. Additionally, pay attention this coming year to see who it is that will cause legislation to be passed that will drive the economy and drive jobs. It won’t be the Liberal Leftists, it’ll be the conservatives led by the Tea Party lawmakers. Again. Obama will sign it. But it won’t be because HE caused it to occur. Anyway, the point is, Canadians come to America for life threatening care. We don’t go there. And they do it in large numbers. Pino: Our deficit problems are due to social welfare for the rich nanny state programs. There, fixed it for ya. You’re welcome. Although feel free to continue your tirade against the government, while mandated state capitalism, that is government run for the benefit of business, ruins your country. Picking on the poor, like most libertarian targets, is low hanging fruit. Yes. Government welfare for the rich is as bad as it is for the poor. Thanks for that government issued license. Sheep. I what way and manner have I picked on the poor. You continue to use the exact, the EXACT, argument I accused you Leftists of earlier. You market your outrage better than anyone. When you are faced with an argument you are unable to defend, you pull out the “You pick on the poor!” routine. Pino, You seem really angry. Are you sure you’re not Rush Limbaugh in disguise? You sure sound like him. Do you know what you are talking about, or are you just regurgitating what you saw on T.V.? Can you cite your sources, do you know what that means? I like to read, a lot. For you, I’d suggest starting with Animal Farm by George Orwell. As you read, realize that you sound a lot like the pigs in the story, then decide if that is really how you want the rest of the world to look at you. I’m just saying, you seem really angry, but I’m very opinionated too. Pino, You seem really angry. When I confront ignorance I get frustrated, yes. Sometimes that can sound like anger. Are you sure you’re not Rush Limbaugh in disguise? You sure sound like him. In other words, I find it a touch funny that you listen to Rush. I don’t, however, so wouldn’t be able to tell you one way or the other if I sound like him. ” Pino: Our deficit problems are due to social welfare for the rich nanny state programs. I find that I like to answer a Socialist apologist such as yourself with a concrete example of how your big welfare statist policies really play out over time. They generally hurt the young by denying them opportunity. I offer this article to illustrate my point. I intentionally chose a NY Times story so you could not accuse me of being a Foxnews slave or Conservative zombie. Read the article and gaze at the bright future your philosophy has wrought on Southern Europe and will inflict on your great Country and mine. I agree. Whatever is happening in Europe is a good enough excuse to let crazy capitalist puppeteers do whatever they want, even if they are the one who created the worst economic crisis since the 30’s. Okay, you are right. Fannie, Freddie, and Barney were all just minding their own business lending money to beggars to buy mansions, when those crazy capitalist puppeteers crashed the system. Yep I totally agree with you.